It is time for HR to embrace technology to unlock its full potential and shed the image of a functional support system. Fear of the unknown has always gripped the society and when technology was introduced it created havoc. However, so far technology has not only improved functionality, but the output has been optimized as never before. We are now at a stage where organizations need to adopt technology in order to stay in the competition and in order to succeed one needs to develop adaptability and data-driven workforce. 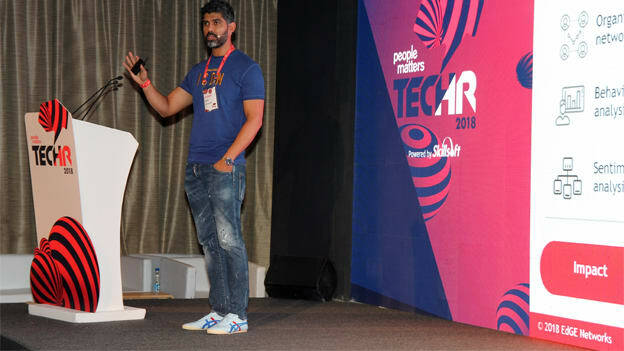 In Tech HR 2018, Arjun Pratap, Founder, and CEO, EdGE Networks speaks about augmenting HR productivity and how to pave the path towards success. Organisations need to concede that technology is here to stay and will keep on evolving to change and rechange the course of actions. To stay ahead of disruption organizations must start well and keep up the path of learnability and adoption of new technology, adaptability with rapid innovations, develop a virtual workforce, create and operate a data-driven organizational culture and balancing the AI and human workforce to create a harmonious yet impactful environment. Arjun states "Using technology means an abundance of data which provides great value to an organization.” A simple yet meaningful statement which defines all the requirements. There are two types of innovation: Intelligent and disruptive. When an organization can analyze innovations its capacity for impact, how well will their workforce adapt to the new technology and what will be the output, it can harness augmented intelligence With the help of new technology and innovations, many organizations can now predict performance and the end goals. "In a changing world, there are many organizational changes like work from home or an agile working environment. However, today what matters is the productivity and quality of work," states Arjun. One of the prominent challenges faced by companies especially in a market where talent war is on the rise is attrition. With the help of data analysis, we can now predict when an employee is planning to quit an organization and ensure retaining them by providing required and suitable options. One can now predict attrition, performance, change output, plans and other critical factors that once hampered the growth of an organization with the help of technology and creative innovations. This in return creates a reliable work environment leading to maximum productivity. The insights provided have created a clear vision of the future and just as Arjun said at the beginning of the session "More than solving the problem identifying it has to be the primary focus." When we can identify the loopholes in our organizational structure only then can we truly succeed. There can be no better ending that the words of the speaker himself which are inspiring and at the same time presents hope that we will emerge regardless of the obstacles. "Humans can accept change easily, and we evolve as per requirement. We have accepted technology due to the paradigm shift, and it also provides us value and the moment it does not we can stop." After all, technology is made by us, for us to succeed.